This book really pissed me off. And the stupid thing is that there was a simple solution that would have made everything okay. That solution? MARK SOMEWHERE ON THE DAMNED BOOK THAT IT IS PART OF A TRILOGY. Up until the last twenty or so pages I loved this book. The characters were great, the story interesting, and I loved the fact that for the most part you can't tell the good guys from the bad guys. However, I was reaching the end of the book when I realized, "I'm almost finished! Nothing's been wrapped up! There is no way that she can end this book in a satisfactory manner! $#%@! There's a #$&#ing sequel!" I went back and thoroughly checked the book--there is absolutely nothing to indicate that this book is part of a series. As far as I could tell (and believe me, I looked closely before I purchased the book) this should be a stand alone book. Nothing on the cover saying, "Book One of the Fafnirbluh Series." I checked the inside pages. There were no other books listed as written by this author, so no giveaway of "Lord Fuffydog (coming in 2008)." In the ad pages in the back there were no other books by this author, so no hint of "Gee, that title and cover look a lot like this one! Perhaps it's a sequel." Nothing. No warning at all. I can't even begin to describe how much I hate the feeling of getting to the end of the book and realizing that there is a sequel that I do not have and know nothing about. And it's a great book. There are several lead characters and they're all female. 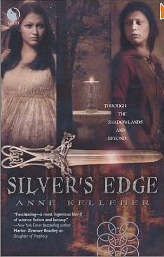 In addition to the three main characters there are a variety of supporting characters, and Anne Kelleher has done such a good job writing those characters that for most of them you can't tell whether they are evil, misguided, or actually in the right. And I love characters like that. The story moves quickly, and although there were romantic bits, there weren't too many of them, and they didn't detract from the story. I also loved the Celtic bits that wove through the story, including the Morrigan. But instead of being happy that I read a really good book, I'm royally pissed because I'm left hanging. And I'm mad enough that although (as I said) I really liked this book, I may not buy the sequels, just because I feel like a dirty, rotten trick was played on me. Great book. I loved the story. Loved the characters. Despised the fact that this was part of a series was hidden from me. So the first black mark for Luna Publishing--and it's a big one.